There was never really any question about what the top mascot would be in the state of Montana. No one ever had a chance to unseat the Sugarbeeters. In USA Today’s top mascot competition, the Chinook (Mt.) 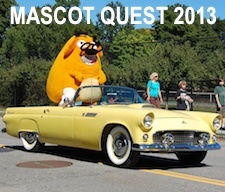 High Sugarbeeters ran away with the competition, blowing past the two other notably odd mascots in the mountainous northern plains state, the Wardens and Refiners. As noted by USA Today, the Sugarbeeters were a natural choice for Chinook because of the town’s long history with sugarbeets. Chinook is one of the main producers of sugarbeets in the upper plains and the local high school wanted to pay homage to the crop that helps the student population survive comfortably. Still, school officials realized quickly that sugarbeets aren’t the most fear-inspiring vegetable (perhaps that’s a redundancy? Are there fear-inspiring vegetables? ), so it gradually introduced changes to the mascot’s appearance to make it more fierce. The current incarnation of the Sugarbeeter that you see above right even incorporates whirling beaters -- get the pun -- in the place of legs. Whether or not that is intimidating is up for debate. What isn’t debatable is that the sugarbeeters are downright fun as a school sports representative. Looking for the strange? In a state with as small a population as Montana, they’re both already listed above. In this case, the Deer Lodge (Mt.) Powell County High Wardens certainly take the cake. The school used its mascot to pay homage to the area’s long history of hosting correctional facilities. According to USA Today, the first territorial prison in the part of the country that is now Montana was located in Deer Lodge and the current Montana State Prison is situated within five miles of the Deer Lodge city limits. The only question is why Powell County’s Wardens haven’t ever lined up a game against the Yuma (Ariz.) High Criminals. The Sunburst (Mt.) North Toole County High Refiners earned their name for a rather commonsense reason: For years, Sunburst was the home of a large refinery. That oil refinery has since left the town, but its legacy remains now in the form of the high school’s sporting nickname.